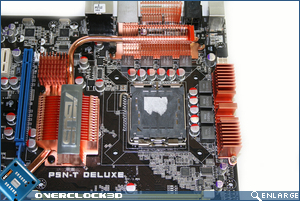 The Asus P5N-T Deluxe is again a well laid out and well thought out board from Asus. It seems boards nowadays have less and less of the niggles that we used to see, and didn't want to, and have more and more of the features that we do want to see. 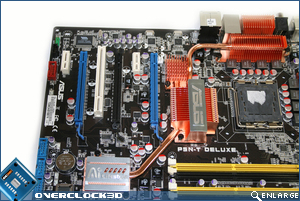 As on the P5E3, there are no waterblocks (a good thing in my opinion) and again we see a large heatsink configuration on the board. 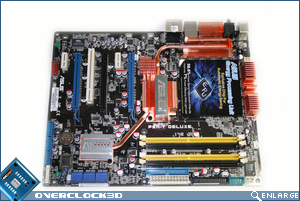 100% solid conductive polymer capacitors are used throughout the board and Asus have again used their excellent 8-phase power management. 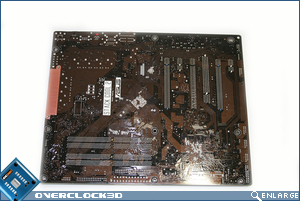 The black PCB is again used by Asus and you cannot complain about that. 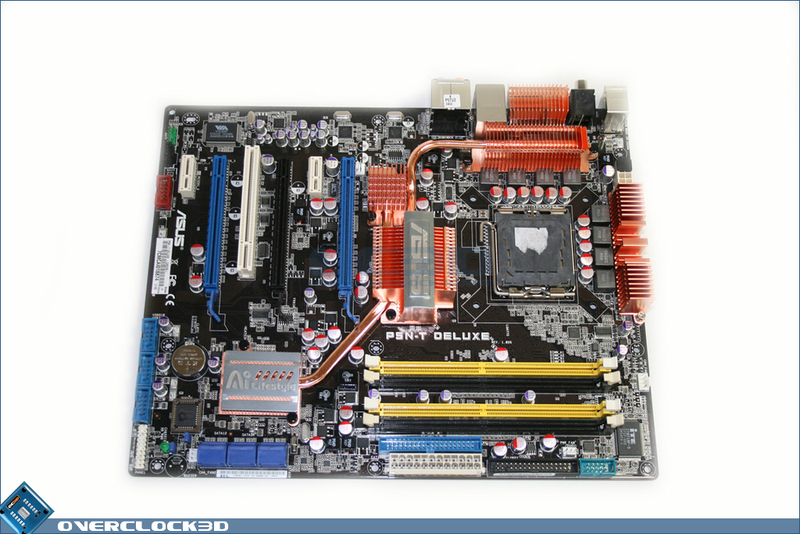 The colour layout of the board is again easy to use and clear, although I would have liked to see just blue, white and black used as in some of Asus's better looking boards. 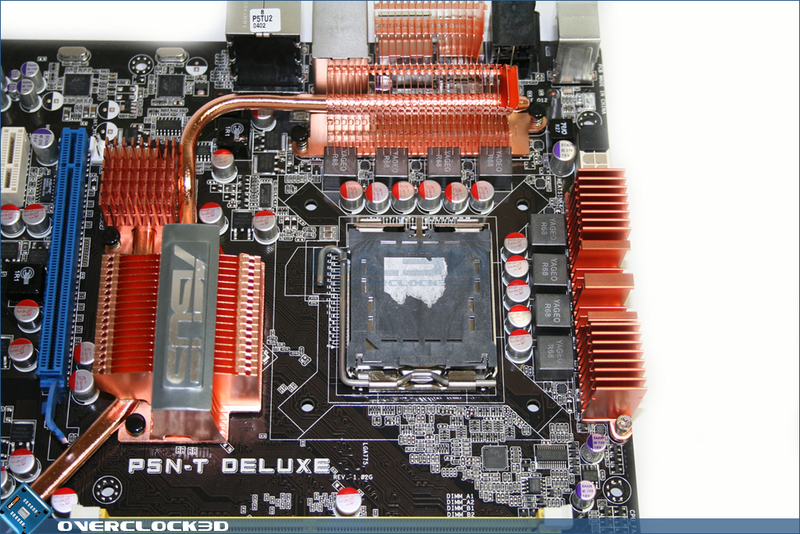 Again though, Asus have put some nice design ideas in there with flipped 90° SATA connecters and everything close onto the edge of the board. The only thing different to the P5E3 in this respect is the lack of 90° flipped IDE connector, but I guess this isn't a real big issue. 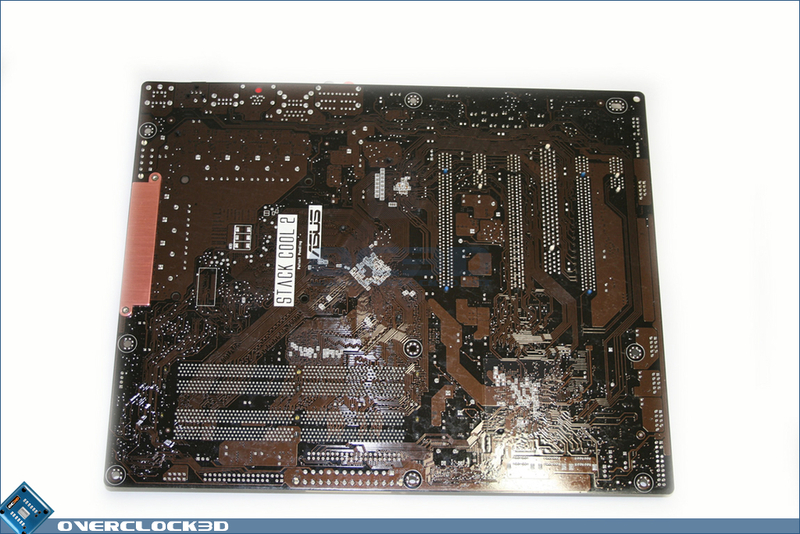 I would also have liked to see some sort of onboard power and reset buttons and a POST readout LED of some description, although those sort of things tend to be restricted to Asus's RoG boards. 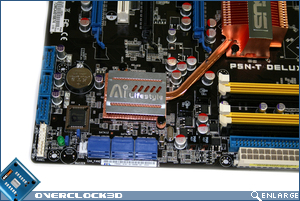 The CPU area isn't as packed as that of the P5E3 and the right-hand PWMs only have a heatsink on, not plugged into the heatpipe cooling system. 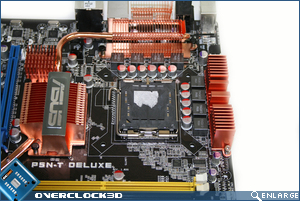 As usual, Asus have supplied a fan to go over the top heatsink in the heatpipe array, although you should not need this if you have decent airflow and a fan on your CPU cooler that can cool them. There's also plenty of room for manouvering with a large cooler and the Noctua I installed on the board went on without a hitch. 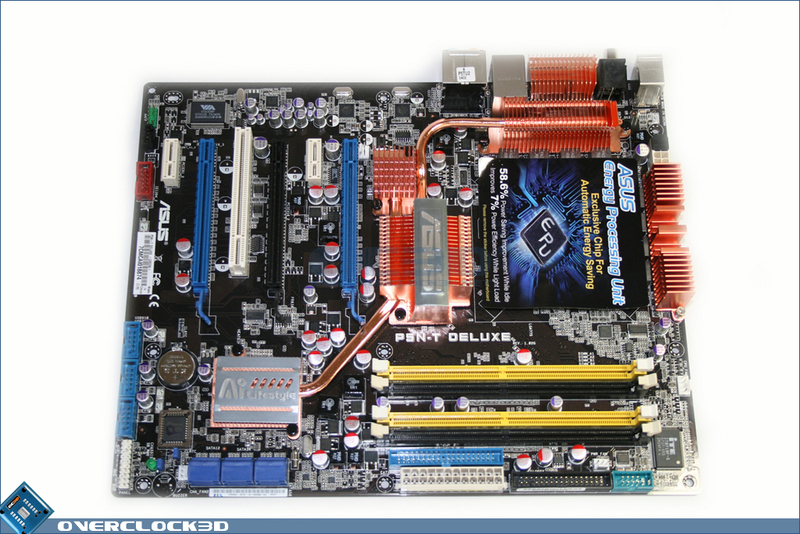 The RAM area is kitted out with all of the connectors at the side, although the IDE connector has a particularly bad position which could be hard to get to as the main ATX 24PIN cable is right in front of it. This is the worst niggle on the board and could be a bit of a hassle. 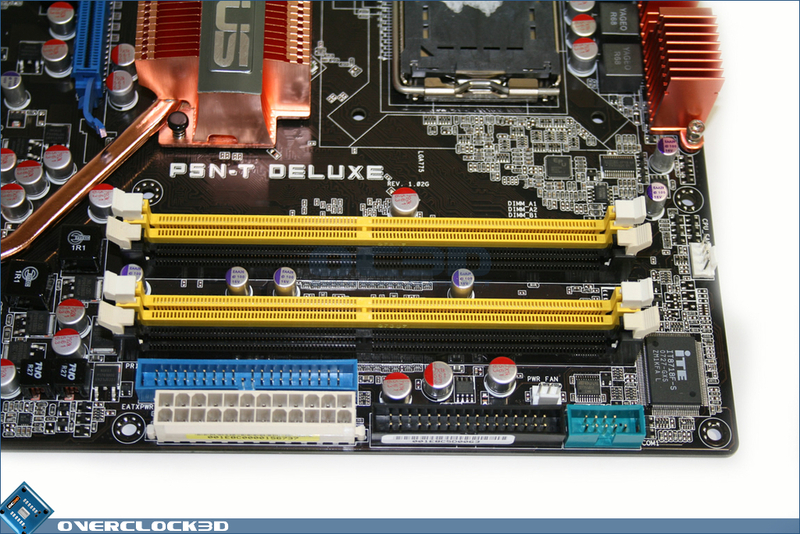 On the upside, the RAM slots are easily far enough away from the CPU socket to make sure you should be able to install any RAM there and not have to worry about clearance. 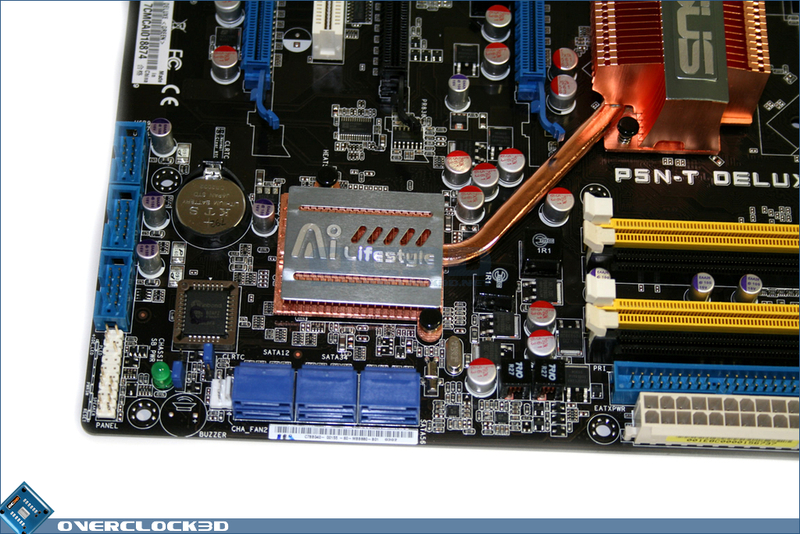 Asus have again used their stack-cool PCB feature to make sure that the heat goes away from the problem areas and have also added an extra heatsink on the edge of the board to make sure that the PWMs get cooled effectively. 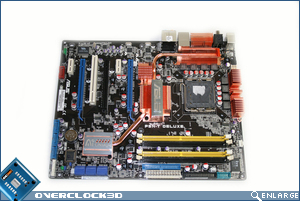 The place where the board really steps up is in the PCI-e department. 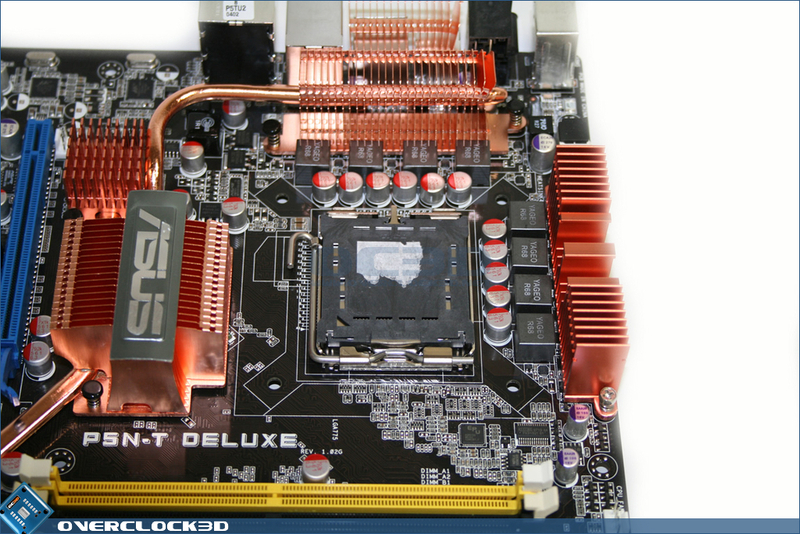 With 3 x PCI-e 2.0 slots, you can put 3 x high-end graphics cards in there and have yourself an SLI monster. 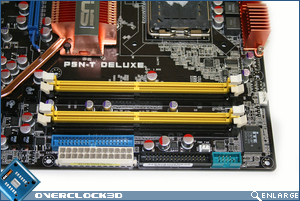 Asus have also supplied an extra-long SLI connector to make sure that you use the two blue slots for SLI, which is good as it also frees up the PCI slot for use with that all-important sound or physics card. Here you can again see the general layout of the board is pretty good, although as I have stated previously, it would have been nice to see a Power/Reset switch and perhaps an LED POST readout. Overall the P5N-T has a few niggles but doesn't do too badly for board layout.